My Long Fist grandmaster, Grandmaster Li, Mao-Ching, spent 23 years and 1 month in the Chinese military during harsh wartime conditions while he trained everyday. 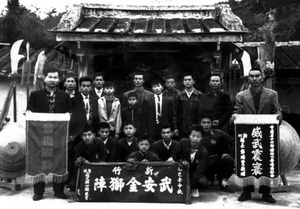 My Long Fist grandmaster, Grandmaster Li, Mao-Ching, spent 23 years and 1 month in the Chinese military during harsh wartime conditions while he trained everyday, under Great Grandmaster Han, Chin-Tang, one of the foremost traditional martial artists and graduates of the Nanjing Central Guoshu Institute. Similarly, my White Crane grandmaster, Grandmaster Cheng, Gin-Gsao, lived with and trained under Great Grandmaster Jin, Shao-Feng for 23 years until Great Grandmaster Jin passed away. In my father's (Dr. Yang, Jwing-Ming's) generation, most students no longer lived with their masters but oftentimes trained for a minimum of 2 hours a day during the academic year, and about 4-6 hours a day during the off-seasons, nearly everyday of the week. My father began training when he was 15 years old and has not stopped since. He is 62 years old now. Today, we see the recurrent pattern of students training only a few times per week for a just a few hours at a time, oftentimes stopping and resuming in different seasons or periods, or completely quitting after some number of years. By these observations, it would seem that today's generation is learning and progressing at a rate that is perhaps at least 4 times slower and less efficient than that of older generations. Top that off with today's looser and less restrictive teaching methods, and we realize that traditional martial arts training today is, unfortunately, on a decline. When asked by my father how much of Great Grandmaster Jin's knowledge had been passed down, Grandmaster Cheng did not say a word but instead held up the back of his hand and blew off some dust, signifying that it was very, very little. Sadly, Grandmaster Cheng, with only this small fraction of Great Grandmaster Jin's knowledge, passed away without having taught more than 50% of what he knew to my father's generation. However, even with such a small portion of this knowledge, my father established himself as one of the leading pioneers of martial arts today. To think about the level of martial arts that could have been achieved in this lineage alone had Grandmaster Cheng finished his training with Great Grandmaster Jin and had Grandmaster Cheng not passed away so suddenly, is simply mind-staggering and creates an immeasurable feeling of loss. Extend this to other lineages and the entire realm of martial arts, and we realize that with each passing generation, the precious, irreplaceable knowledge of the truly great masters of the world are exponentially fading. Upon visiting Grandmaster Cheng's grave in 1979, my father made a vow to preserve, develop, and pass on as much knowledge as he could. This has proven to be a challenging task in the past 40+ years that my father has been teaching, but to this day, he continues to explore new methods and endeavors in order to keep his promise. In modern day societies, preserving martial arts can indeed be quite a daunting mission. We live in a world filled with many influential factors and distractions, variables that influence our everyday lives and the manner in which we train. Amidst jobs, families, relocations, earning enough money for sustenance, and trying to maintain some sanity with a social life, many students simply have poor attendance or consistency in their martial arts training schedules. It is becoming increasingly more and more difficult to find a student who will and can follow a master for an entire lifetime. A big difference between students of the past and students of the present is the percentage of them that completes a comprehensive training program at an authentically traditional school and continually practices throughout the rest of their lives. Much of today's generation lacks the dedication and motivation that students of the past almost inherently had. There are many more distractions in today's lifestyles that deter us from staying on the path of disciplined training and martial morality. Martial moralities developed through hundreds of years of development and cultivation. Although most martial arts schools today embrace and mention their importance, few enforce them or delve too deeply into their meanings. We simply do not train as deeply or as much as students of the past did. Part of the reason for this is: today we are spoiled, and we have different priorities. For example, we have the luxury of picking and choosing our masters and schools, and we also have the freedom to leave on a whim if we choose to. While it is an advantage to be able to explore martial arts from so many different angles, many practitioners forget the meaning of diligent training and become more interested in learning what's next or what's new instead of training what they already have. Martial arts has evolved into more of a sport or hobby, as opposed to a lifestyle or necessary means of survival. The deeper meaning behind its philosophy, culture, and history is slowly being lost. The entire concept of loyalty, patience, and discipline has been diluted. We have a plethora of quantity at our hands but no quality. Some students are merely curious about the art or have an appreciation for it. Others are looking to gain some fighting skills to compete in the ring, to see how far they can push their limits, or to be able to defend themselves in the occasional scuffle. Some are only looking for a physically demanding activity to do, much like joining a gym or playing a sport. It is almost as if a master exists today to merely provide a service to students, which is completely backwards from ancient tradition and history, where students typically served their masters for entire lifetimes. This is an unfortunate outcome of modernization, and at the moment, with the economic struggles and financial needs of schools and businesses, little can be done to change it. We should acknowledge, however, that a lifetime of martial arts is not for everybody. If a short period of training is able to help a practitioner get to a better stage in his or her life, then it will already have been worth the trip, even if it is a short one. There is no need to force any additional training if that is all the practitioner seeks or cares to benefit from. That is one of the advantages of modern day training; we are not coerced into training, and the discipline and values we develop from it are genuinely our own. On the flip side, modern day training is also a great disadvantage because practitioners with weak minds have more difficulty focusing and thus, advancing in their training. A similar comparison is how discipline is taught and enforced in military boot camp or military school. But remember, while it may work to discipline some participants through harsh, demanding environments and such extremely disciplined training, it is not necessarily fit for every individual. We must accept that we live in quite a different time compared to that of ancient China, and although we may not be able to mimic exactly what martial artists of old have accomplished, we can still extract and adopt the same principles that their training was built upon. From there, we can apply that foundation to our own modern day training methods. What we need to do together in the martial arts community is preserve the authenticity and quality of this foundational training. We need to collectively filter and openly share the best of what we know so that we may once again, transform this art into a highly-advanced and deeply intricate craft as it once was, but with a modern twist on it. From that milestone, we will be able to effectively develop martial arts today into an equivalent but modern adaptation of the training methods of ancient China. End of Part 1. Read Part 2 here.